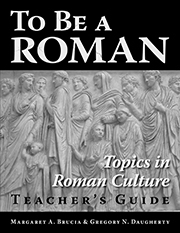 To Be A Roman Teacher's Guide is designed as an aid to busy teachers using the popular To Be A Roman, a cultural enhancement to Latin language courses. This Teacher's Guide is everything teachers need for rapid grading of homework or to conduct in-class oral quizzes. Brief answers are provided for the objective exercises and activities at the end of each chapter, such as True or False questions, Matching Columns, Fill in the Blanks, Word Searches, and Crossword Puzzles. For exercises and activities seeking responses more subjective in nature, this guide provides suggestions wherever possible.